Have a look at this enticing candleholder with a silver stand, which is one of a kind. 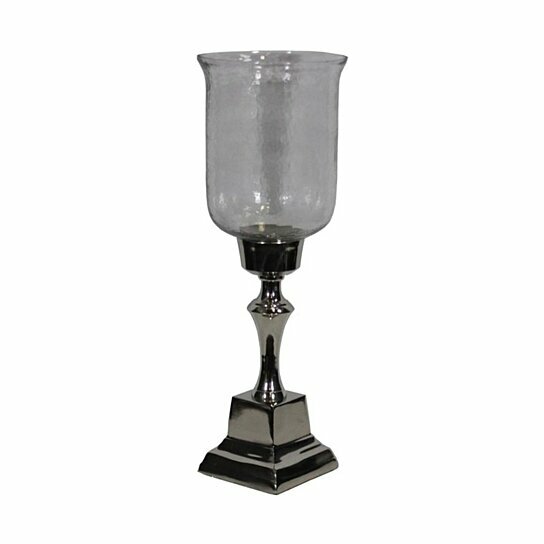 This candleholder has a hammered glass hurricane offering ample space to keep a medium sized or pillar candle. You can keep this lovely accent piece on any side table of your choice. Looking at this well shaped candleholder close ones and visitors paying you a visit will be alarmed to see it. Made from glass and metal, it will stay in pristine condition for years. Antique in looks, it flaunts a royal appeal. Use it as a filler or light it up and adorn it in the patio to make the outdoor place engaging.